Given the importance that the right set of golf clubs can have on your game, it is understandable why so many golfers make this their main focus when they think about which golf equipment to buy next. There is no denying that finding a set of golf clubs that are comfortable and can enhance your game can be very important for golfers but you should always spare some thought for how you store your clubs at home and how you carry these clubs around the course. There is no point in spending a lot of money on golf clubs only to have them ruined by a poor golf bag. There are many different things that a golfer should consider when looking for a new golf bag and different golfers will have different ideas about the importance of each element. The bag should always be big enough to carry all of the clubs you currently own and you should always leave some room to store additional clubs. Many golfers will add to their club collection over time and if you don’t want to leave any clubs behind, you need to make sure that your golf bag has the space to hold some new additions. Another big requirement for many golf bags is how comfortable they are to lift and carry around a golf course. 18 holes can be a long trek if the straps on your bag dig into you or the bag is not comfortable to hold. Thankfully there is a wide range of golf bags available to choose from at 118Golf, which means that you should be able to find a bag that is comfortable. While the functional nature of a golf bag is very important, it is fair to say that many golfers will have a strong interest in the fashionable nature of the bag too. 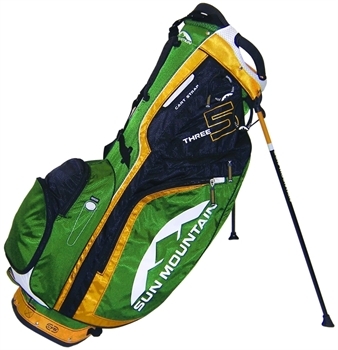 If you are going to be using a golf bag regularly and it is something that your friends, associates and peers will see you with on a regular basis, it is important to ensure that your golf bag matches your image or at least looks presentable. Golf can be a fun activity but a lot of people do business on the golf course and presenting a positive image at all times can often make the difference. There is also going to be a need to consider the price of the bag and how this fits in with your overall budget. There are many different things to consider when choosing a golf bag but thankfully there is a very wide range of golf bags to choose from. Next post: Bent My New Pitching Wedge!